The electronics can be assembled on to a prototyping PCB board. The two 9 volt batteries are aligned across the interior wall, see fig 28. 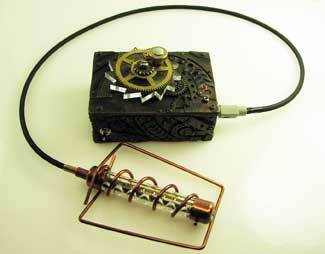 Plug in the Geiger counter wand. Turn of the power from the 9V batteries. 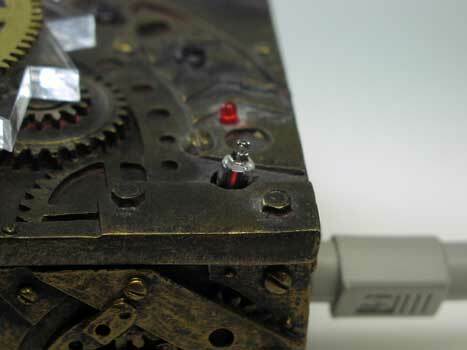 The saw switch is rotated at a medium pace for about a minute or so until the NEON bulb lights up, see figure 29. Bring the wand close to a radioactive source. You should see the LED pulse and speaker click every time a radioactive particle is detected. When the neon light goes out, the detecor will still have enough voltage on the capacitor to power the GM tube, but its not reliable. When not in use remove the 9V batteries.